There is a rapid increase in scams spreading through the messaging app WhatsApp, in recent times, there have been deceptive campaigns luring users of the messaging App into becoming victims. 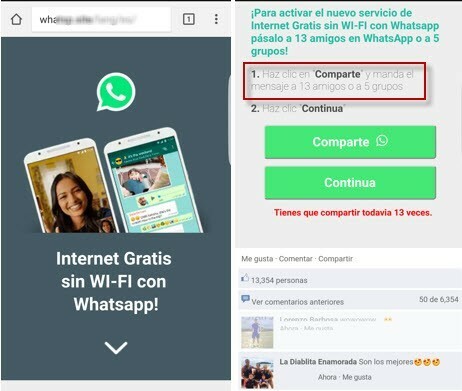 The latest of these scam is a message in circulation promising WhatsApp users a free internet service, without needing to use Wi-Fi. Notwithstanding this being a complete nonsense and a fluke from a technical point of view, the offer nevertheless seems appealing to WhatsApp users unaware of the realities. The victims are told that they can still their WhatsApp messaging app without needing WiFi or mobile data from the telecom/internet providers. This lucrative offer as usual is being distributed as a random WhatsApp message and shared among individuals and groups on the popular messaging app and often comes from one of your contacts who recommend the service. The message contains a link that is supposed to guide the victim to the page that is giving away such an excellent offer of free internet. 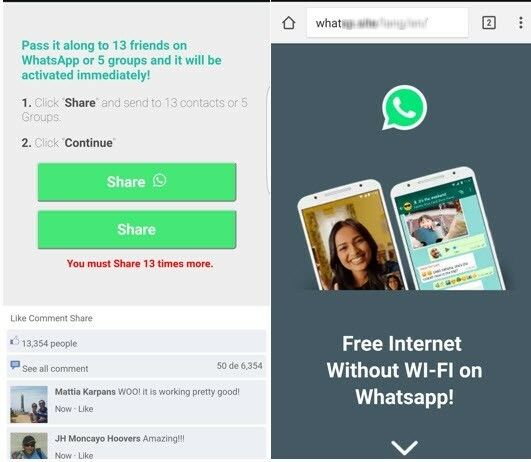 However, as it normally happens with these scams, Once the link is clicked, the page will detect the device’s language and show the following images, with the intention of making the scheme credible and leading the victim to share the content with at least 13 people. This is obviously I an attempt to keep the scam spreading among WhatsApp users. After the victims had shared the link with 13 others on WhatsApp, the expectation is that they receive free internet however, they only get redirected to other sites which ask for subscription or offer costly SMS services including third party apps. No matter what service the victim chooses to utilise, the victim won’t ever get the free internet package as promised. The image on the right is a screenshot of the result of clicking on the link. you can see some comments from people who supposedly tried the service, stating that it works. This is a ruse. Clearly these messages and the profiles associated with them are fake – they aren’t on Facebook at all, so this is all part of the fraud. This behaviour is widely used nowadays, mostly because it allows cyber criminals to create different scams using the same pattern, in order to make them credible for users in multiple countries. This way, they don’t depend on a single country or language and they can target different nationalities all at once.